I’d like to say that as the truck revolved in the middle of the road, I had an epiphany. “The light flashed before my eyes and descending from the realms of the gods, unto me, was endowed prophetic wisdom for the Anthropocene era.” It would sure make for a better story than the actuality of the matter. The vehicle started to shudder violently as though it had been attached to a 1930s vibrating belt massager. Before I could react, the rear end began to swing out right. I attempted to keep it on course and turn into the swivel, but it was hopeless. 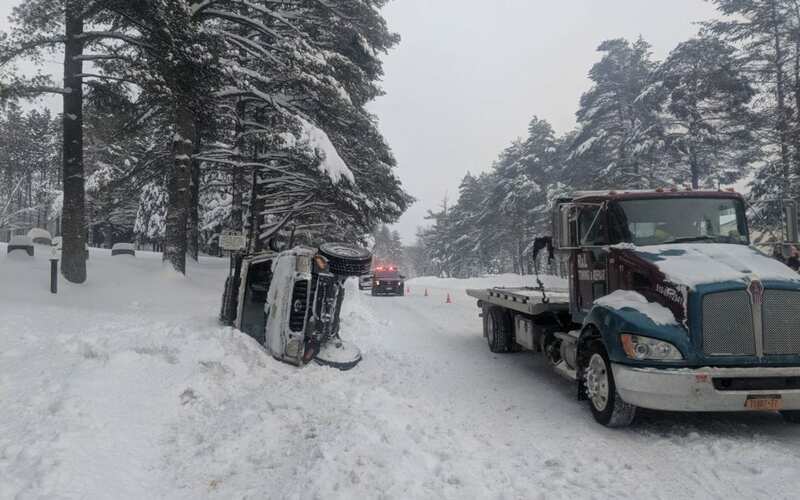 The road was a slicked-out sheet of snow pack, and at 40mph, my truck danced across it like a water droplet on a hot wood stove, with absolutely no regard for predetermined vectors. As I continued to get a perfect panorama through my windshield, I caught a glimpse of the white truck I had just passed going the opposite direction. At this point, my mind went blank and my reactions primal. As though a switch had been flipped for conscious thought and my reptilian brain took over… because that’s what I want. I want the most ancient regions of my brain to handle me hurdling at unfathomable human speeds of the modern age. Luckily, I had my subconscious to rely on as well. I impacted the snowbank, in my head I heard ‘roll over roll over roll over! ‘ All that training to respond to IED strikes finally paid off stateside. My body reacted at once, absentmindedly. Hands shot to the roof, feet off the pedals and anchored to the floor panel to brace the impact. Ol’ Girl Matilda (my truck) listed over her right side and into a 5-foot snow bank, and there she sat on her side for the next hour and a half. I quickly popped my seat belt and reoriented myself to the prevailing laws of gravity, and in due fashion fought it as I exited my door. It felt like popping open the hatch to an up armored vehicle once again. Emerging from this hatch was different though, with my feet firmly planted on the ground, there were no more existing threats to engage with. My heart was still racing as I looked down at my feet and slowly about my surroundings. The chemical cocktail of my endocrine and pituitary system still surging through my circulatory system left me painfully alert. Two trucks had already stopped and a third was coming to a halt. Five people had come to ensure I was alright, three from Paul Smith’s College and one man local to the Adirondacks. I had no idea what happened. Three Paul Smith’s students, Karsen, Hannah, and Ben reached me first. They saw what had happened from behind and seemed surprised at how chipper I was. After assuring them I was fine, Lucas pulled up. I turned around to have a look at the mess I created. There Matilda sat, on her side like a hurt water buffalo waiting to be torn apart by lions. Karsen, a good friend, and member of the student veterans club asked, “What happened bud?” “I don’t know” I told him. “It almost felt like the engine seized up, the rear end just shot right out from behind me, something went wrong.” Lucas was just making his way over by that point. He said that at first, he thought I was just having some fun in the snow until I just kept sliding. He was the white truck I had pasted moments prior. By this time, the local man was making his way over. I assured him of my health as well and then we all started to consider the task of truck recovery. Ben suggested we try and “just push it over.” It seemed to be leaning a little towards the road, but I didn’t think it would happen. I also told him I didn’t feel comfortable with people behind the truck just in case it started rolling further. We tried anyway… she didn’t so much as give a millimeter. We walked back around and Lucas started attaching a hitch to Matilda’s receiver, and as he finished, gave the rear wheel a slight turn. The wheel, since the truck was still in gear, should not have turned much. Surprise… this wasn’t the case. The tire had about 1/16th rotations worth of play. “Well there’s your problem” someone said in a most ironic manner. The universal joint was completely missing a bearing. I clamored my way back inside to put the truck in neutral before more serious attempts were made at a recovery. The next logical option was to hook a ratchet strap to his truck and try and pull her sad, helpless, soon to be carcass over. Not a chance, she didn’t give a bit as the truck spun out on the slick road. I called it, we were holding up too much traffic trying to recover Matilda. The local man had been directing traffic while we attempted, and a cop had pulled up in the meantime and was doing the same from the other end. As I detached Matilda from his truck, I accepted defeat. In hindsight, I could have hooked the ratchet strap to Lucas’s diesel and just slowly cranked her over. The background music for this three stooges display was the firehouse siren. I didn’t put together the possibility that the call to service could be on my behalf. The police officer came walking over disappointedly, “I was hoping you guys would get it.” No such luck would be had that day. The officer present called another officer in to handle the situation and left the burning vestige of his presence behind. As the flares burned down, I dismissed all the gracious Samaritans and thanked them for such valiant selfless efforts. It seemed their heads hung a little lower than upon arrival. As though my fight were theirs in that moment of shared chaos. When the calamity won and took hold over my situation, so it did in their vested portion. At least for them it did not last long, I hope. I was offered to get into the rescue engine to stay warm, but I couldn’t do it. That old breed mentality still shaping many of my actions. If I was the reason the fire crew had to stand around in -24°F weather, I would too. While waiting on the tow truck to arrive, I had to get into an ambulance just to let them take my blood pressure and then sign off that I was refusing care; a check in the box to remove any liability from them. When the ambulance was pulling away after my John Hancock was provided, the tow truck came shortly after. I watched them hook up Matilda, right her, and hoist her onto the bed. The ordeal was over… or at least a component of it. Both the officer and the volunteer fire crew offered me a ride back to school, less than a mile away. I refused. I reserved my right to walk back through the blistering cold with my head hung in shame (and partly to shield from the -24°F wind). The walk provided for a nice period of reflection to stew over the up and coming stresses of the situation; insurance, transportation, funds, living quarters. The thing that stood out most however, was the dark irony of why my bearing failed. Two days prior to the incident, I had spent time down in the high peaks’ region pulling people out of the snow without charge. All that towing had put an excess of wear on the bearing until it finally just gave out. There I sat, with my truck on the side of the road waiting to be rescued, just like everyone I had helped two days prior… what the hell.